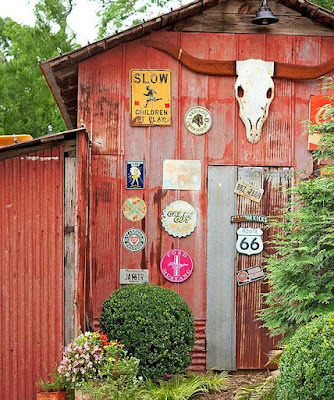 Gourd Planters ~ Transform gourds into planters for the fall season. Simply hollow out the gourds and tuck in the root balls of ornamental grasses or sedge (a perennial herb). Draw jack-o'-lantern faces onto the gourds with paint pens for a Halloween-theme arrangement. Pumpkin Tree Tabletop Decoration ~ Simple decorations can make a dressed-up tabletop for fall. A few cylindrical vases filled with birdseed provide a sturdy base for long branches. 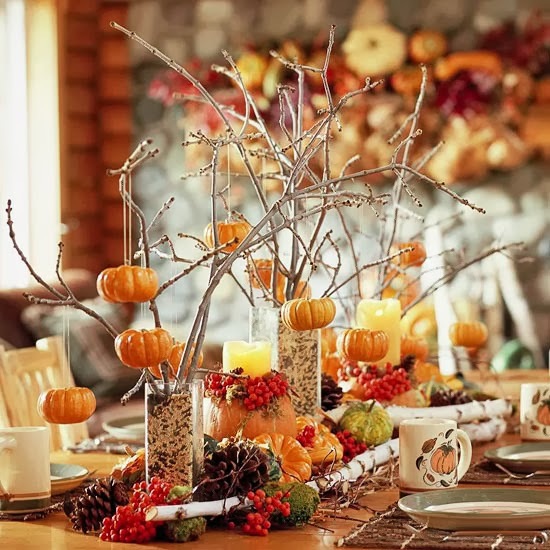 Small pumpkins -- suspended with bits of twine -- hover above a beautiful assortment of branches, berries, and pinecones. 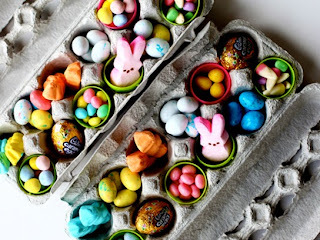 To craft the candle-displaying pumpkins, hollow out a few gourds and tuck in candles and berries. 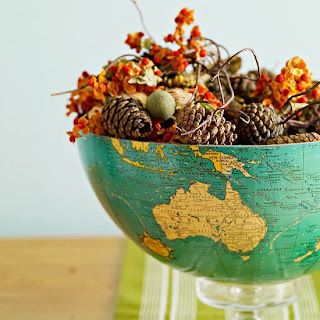 Eclectic Fall Bowl Centerpiece ~ This decoration can be fashioned easily with a fall nature hunt and a halved globe used as a bowl. There's no need to plan the arrangement -- simply mix the treasures together: pinecones, bittersweet, acorns, and branches make the perfect fall centerpiece. 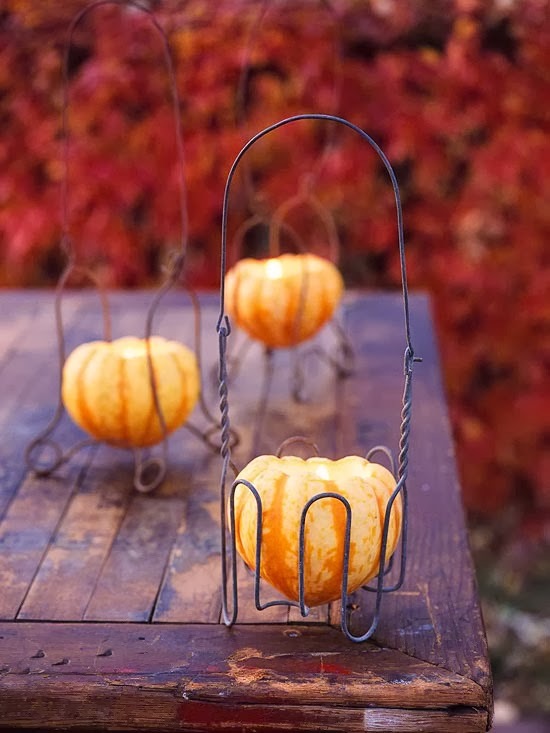 Pumpkin Luminaries ~ Illuminate a fall night with candleholders fit for the season. Carve a small hole in the top of a miniature pumpkin, wide enough to hold a votive candle and deep enough so the candle can be nestled in securely. For a rustic look, display the pumpkin inside a wire jar holder as shown here. 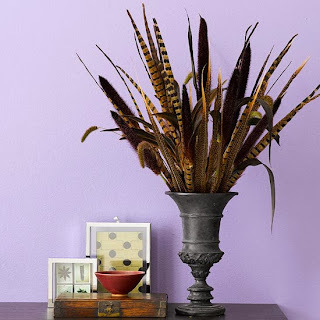 Tall Grass-and-Feathers Tabletop Decoration ~ This decorative arrangement of cattails, pheasant feathers (found at crafts stores), and Purple Majesty ornamental millet doesn't need water, so it will last all season long. 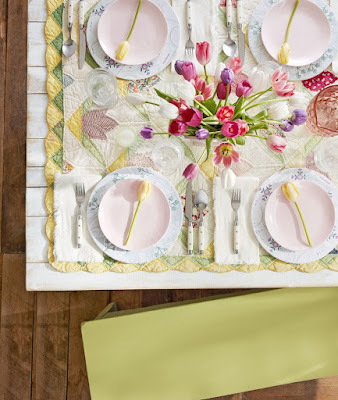 Tip: Place chicken wire or floral netting inside an urn to create structure within the vase. 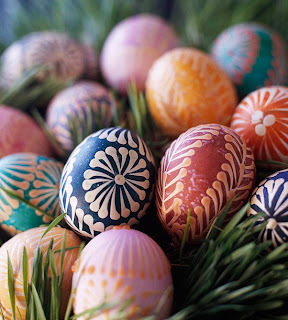 Mold the wire into a ball to fit the bottom of the vase and stick the stems into the holes to complete the arrangement. Pumpkins and Pinecones ~ Transition pumpkins into late fall by adding pinecones to your displays. 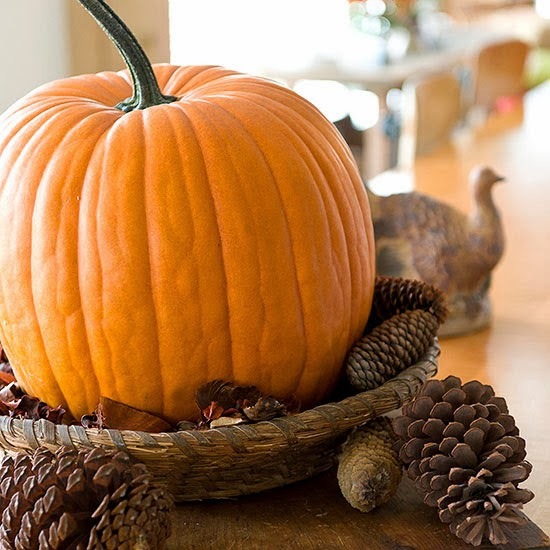 For a late-fall centerpiece, place a large pumkin in a shallow basket and surround the base with pinecones. 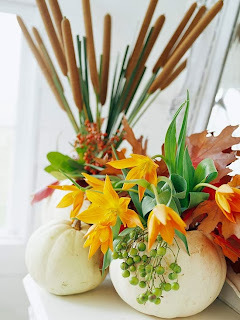 Prettiest Pumpkin Vases ~ White pumpkins double as vases and make for an artful, natural fall display. 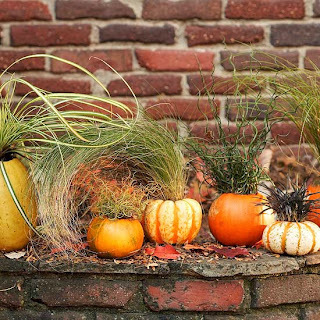 Tuck leaves, orange flowers, and cattails into a vase hidden inside the hollowed-out pumpkins. 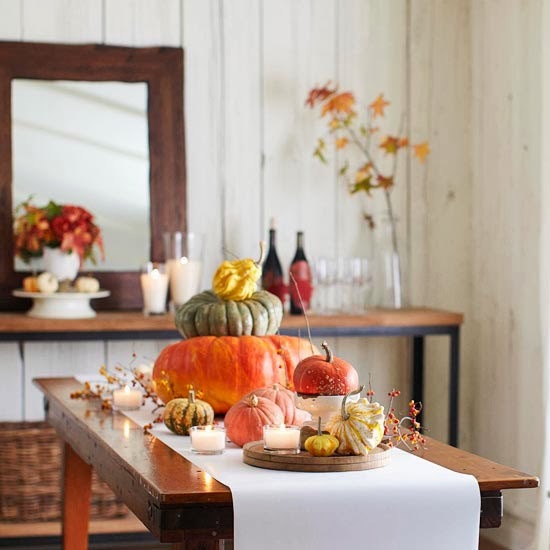 Tabletop Pumpkin Display ~ Repetition of color, whether with pumpkins, foliage, or flowers, creates a unified fall decorating scheme that accents all of fall's bounty. 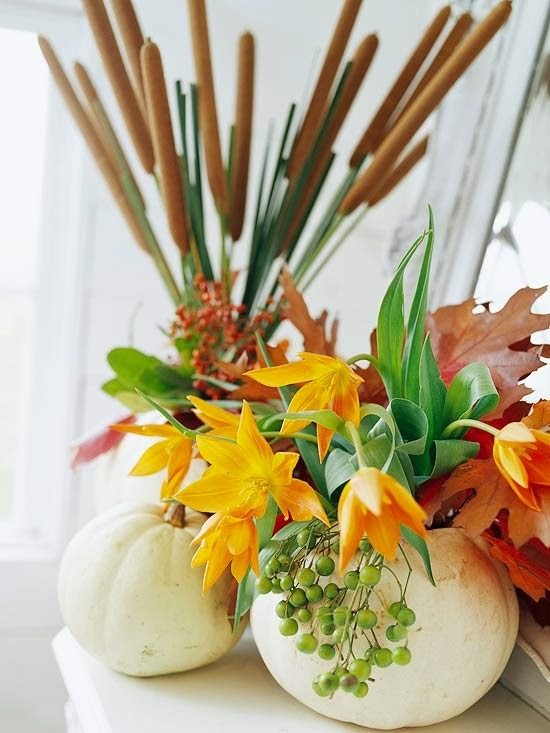 Dominant tones of orange and yellow are present in a vase of blooms and a cluster of branches on a sideboard, in addition to the main pumpkin display.